The Nomus iMux & iMux/V families of products are a very cost-effective solution for transmission of Ethernet Data over Bonded Multiple E1s. They use the ITU based GFP/VCAT/LCAS standards for framing, bonding and provisioning of up to 1, 4, 8 or 16 E1 circuits for increased bandwidth for broadband applications. The iMux family supports one Ethernet Port on a 10/100 Base-T RJ45 port, or on a 100 Base-FX Fibre Port. The iMux/V family supports an additional 10/100 Base-T RJ45 Ethernet port. 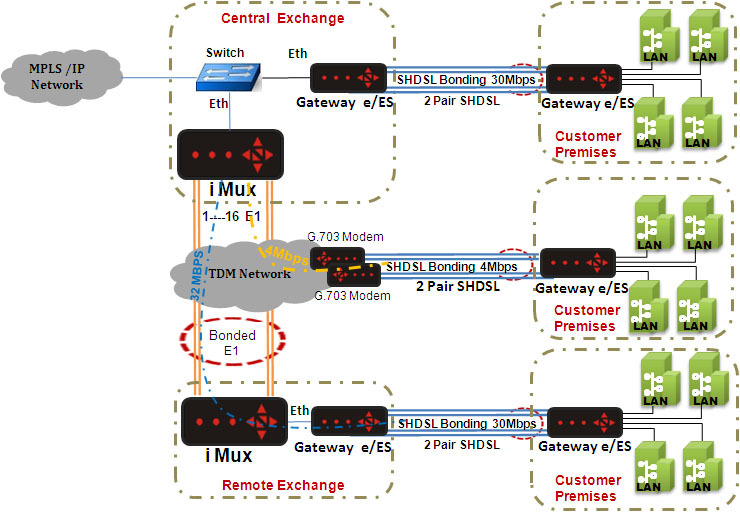 The iMux/V family also features VLAN based forwarding on up to 2 or 4 Virtual Concatenation Groups (VCGs) for one-to-many or Priority based applications. Delay compensation of up to 200 ms is supported within individual links of a VCG. The LCAS provisioning feature allows additional channels to be added or removed as required without the intervention of an operator. Bridged mode with packet filtering and forwarding is based on the Ethernet MAC address and a Self-Learning algorithm. The Nomus iMux & the iMux/V families can be managed with convenient DIP-switches & LEDs and via HTTP, Telnet or Console. SNMPv1 and v2 with Traps allow management via industry-standard Management Platforms. 10/100 Base-T Fast Ethernet interface on RJ-45 connector or an optional 100 Base-FX on SC or LC Connector. Fiber supports SMF or MMF modes. Additional 10/100 Base-T on RJ45. Protocol independent bridged mode of Packet filtering and forwarding with 4K MAC address storage with VLAN ID and priority based on 802.1p or DSCP. WAN interface available with 1, 4, 8 and 16 E1/G.703 ports. Up to 4 Virtual Circuit Groups (VCGs) for one-to-many transport. Scheduling into 4 Priority Queues within a VCG based on QOS Priority.